FOXWEDGE (AUS) (Bay 2008-Stud 2012). 5 wins-2 at 2, MVRC William Reid S., Gr.1. Sire of 408 rnrs, 233 wnrs, 11 SW, inc. Volpe Veloce (ARC Railway S., Gr.1), Foxplay, Urban Fox, Noire, Fox Swift, Hertford Dancer, Infamous Fox, Sadilla, Stella Victoria, Fox Hall, Kentucky Miss, SP Foxtrot Liv, Aristocratic Miss, Into the Abyss, Dyslexic, King of Spades, Seafront, Star Empire, Wedgie, Petition, Volpino, Bocce, Foxtrot Lady, Neola, Sanctimonious, etc. Dream Stream (g. by Dream Ahead). Placed at 3 in 2017-18 in Aust. ABOVE DECK (Bianconi). 10 wins-1 at 2-from 1000m to 2200m, A$934,450, BTC Doomben Cup, Gr.1, GCTC AD Hollindale S., Gr.2, AJC Japan Racing Association P., L, STC Homeshop.com.au Welter H., MRC Moduline Classic H., Albury Gold Cup, STC JW Mailing Services H., Michael Hansel Signs H., MVRC Beacon Lighting H., 2d STC NE Manion Cup, L, AJC Ray Bramman H., Reading 2YO H., STC Guildford Leagues Club H., MVRC Jayco 30th Anniversary Trophy H.
You Beautiful Doll. 6 wins from 1400m to 2500m, A$165,152, SAJC Allan Scott Park Morphettville H.-twice, Distinctive Homes H., 2d Albury Cup, SAJC BK Concrete Cutting H., 3d MRC Gothic H., Master Avenel H., SAJC Luke Handke's Getna H. Producer. ABOVE DECK (Godswalk). 16 wins-2 at 2-from 1200m to 2800m, A$247,170, Balaklava Cup, L, VRC John Holland H., 2d SAJC Foundation SA Cup, Gr.3, VRC Carbine Club S., L, SAJC Da Costa P., L, 3d MVRC Great Western Champagne S., L, Balaklava Cup, L.
PANIPIQUE (Testa Rossa). 5 wins-1 at 2-at 1000m, 1100m, A$306,738, VRC Moomba P., L, Bob Hoysted H., L, MRC Quezette S., L, 3d MRC Thousand Guineas Prelude, Gr.3. Producer. GLENALL (Redoute's Choice). 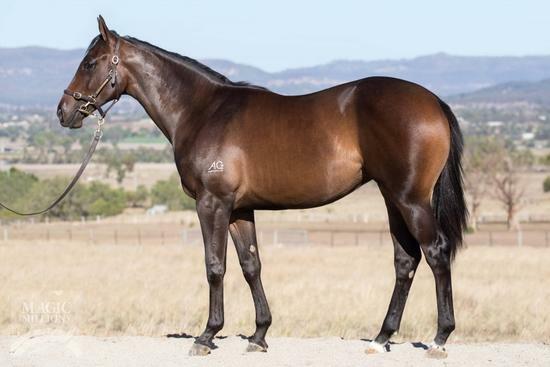 3 wins at 1100m, A$279,150, to 2017-18, Hawkesbury RC Gold Rush H., L, 2d ATC Fireball S., L, Starlight S., L, MVRC Abell S., L.
KISHKAT (Spinning World). 5 wins to 1550m, A$177,000, AJC Toy Show H., L, Blue Plume H., Research H., 3d AJC Chelmsford S., Gr.2. Producer. LADY OF THE TURF (Kenfair). Champion Older Female Stayer in South Africa in 1999-2000. 6 wins from 1800m to 3200m, R601,225, Turffontein Gold Bowl, Gr.2, 2d Clairwood Gold Circle Oaks, Gr.2. Brulant (Mi Preferido). Winner at 1100m, AJC Botany Bay H., 3d VRC AV Kewney S., Gr.2. Producer. KING OF PAIN (Greys Inn). 8 wins-4 at 2-from 1100m to 3200m, R1,863,760, Clairwood Gold Challenge, Gr.1, Kenilworth Selangor Cup, Gr.2, Chairman's Cup, Gr.3, Langerman H., Gr.3, Winter Juvenile S., L, Magnum Mile, 2d Greyville Champions Cup, Gr.1, Kenilworth Green Point S., Gr.2, Durbanville Matchem S., Gr.3, Kenilworth Winter Guineas, Gr.3, Winter Derby, Gr.3, Jet Master S., L, 3d Kenilworth Cape of Good Hope Nursery, Gr.3, 4th Kenilworth Cape Guineas, Gr.1. HISSING SID (Golden Snake). 10 wins from 1400m to 3300m, A$560,080, Warrnambool Cup, L-twice, VRC RSL P., 3d MRC Herbert Power S., Gr.2, Easter Cup, Gr.3.